This mission began on 14 February 2007 (Valentine's Day) in Baqubah, Iraq. An IED exploded and took the life of a true American Hero, Pfc. Branden C. Cummings, 20, of Titusville, Fla.. Typically, we learn of these tragic events through Press Releases by the Dept. of Defense but this mission started on a different footing. Branden's father, Charlie, was notified right around midnight that his son had lost his life doing something that he truly believed in, fighting the war on terror. One of Charlie's first calls was to Branden's fiancé, Danielle, who lives in Texas. Later that morning she sent an email via the contact link at patriotguard.org asking us to contact her and Charlie both regarding putting together a mission to honor Branden. That email was forwarded to us here in Florida. At about 4:30pm on 15 February I found myself on the phone with what turned out to be one of the most amazingly strong eighteen year old women that has ever walked the planet. I think she did more to get me through that first conversation than vice versa. I learned a few things on that first call. The next call was to Charlie. I had a knot in my stomach as I dialed. What do you say to a father that has just received this kind of news? "I am so sorry for you loss" and "if there is anything we can do" seem so inadequate but are the words that seem to come first. There are no words that can possibly ease the pain, only words that show that we do care and are there to support. I did extend condolences of behalf of the membership of the PGR. Although our conversation was short, I did find out that the Casualty Officer was going to be one that we had worked with previously and who is a strong supporter of what the Patriot Guard Riders do. It was also clear that Charlie did want us to stand in honor of his son. Tom "Flaman" Rowell was one of many who offered any local assistance needed in putting this mission together. I asked Tom to do a recon of the Funeral Home. Tom did a spectacular job. He provided a 360 degree panorama of merged photos. I knew exactly the lay of the land after viewing what Tom sent. Everett "OLD-Cop" Butler came out of retirement, also volunteering any assistance required. I asked Everett to take a ride by the Funeral Home and check on a few things that I had failed to ask Tom about. He not only did this but he also made arrangements for the Patriot Guard Riders to stand in honor of Pfc. Cummings at the visitation Monday evening. It was overwhelming to see the comfort that the family took from the PGR's support Monday evening. Charlie told me more than once that if there is ever anything he can do to help us, all we have to do is let him know. It left me speechless that this father, who was going through an experience that I can only imagine, was already working on how he might be able to help another family through his own experience. SALUTE! We also had the opportunity Monday evening to get to know Spc. Jason Deteso who served with Pfc. Cummings in Iraq and who escorted Branden home. Spc. Deteso displays the strength of character and integrity that exemplifies our military. After the visitation was over, we presented Spc. Deteso with a PGR flag that he will carry back to the unit in Iraq. We were also honored with a visit from the family of Sgt. John D. Rode Monday evening. Sgt. Rode was from the same unit as Pfc. Cummings and gave all for our freedom on Valentine's Day in a related incident. Services for Sgt. Rode were scheduled for Wednesday at Arlington National Cemetery. His family felt compelled to come from Orlando to support the Cummings family. They shared with us how much reading the condolences posted for Sgt. Rode on the web site meant to them. I'd like to thank everyone who came out Monday evening. 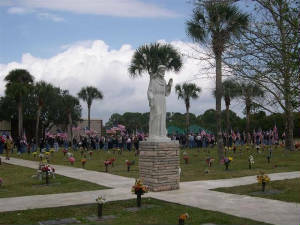 There were over forty that stood the flag line for the visitation. Most stood the entire three hour stretch and it was difficult to get anyone to take a break. Tuesday morning rolled around and Bobbie and I were out of the room and on the road at 6:45am. Staging was set to begin at 8:00am and I like to get there an hour ahead of time. It was a warm, clear morning. The sun was rising over the Indian River Lagoon as we rolled south on U.S. 1. The contrast of the beauty around me to the sadness that I felt in my heart because of the mission at hand was evident. I thought of the time that Branden had spent growing up here and how he would not be here again to see the sights that I was seeing. I saw people starting their day fishing and enjoying the beauty of this place. I looked over my shoulder to the north and wondered how many times while growing up this young man had seen launches over at the Kennedy Space Center? I watched a hawk circle over the river seeking it's prey. Seeing all of this, I understood how Branden would find it within himself to volunteer to fight, and die if necessary, to protect what so many take for granted. It was my prayer that at the end of the day his family and friends would know that his and their sacrifice had not gone unnoticed. We went over a few of the last minute details with the Funeral Director when we arrived. After just a short while the bikes began to roll in. We had been given the outer loop of the oval in front of the funeral home to stage in along with an area in a parking lot across the street to use for overflow. We parked three wide in the oval and were able to get about seventy five bikes on the pavement there. Bikes continued to roll in and filled the overflow area across the street. We wound up with a total of one hundred twenty three bikes and a handful of cages. We formed our tunnel of flags along the drive in front of the Funeral Home, cornered, and continued along the south side. Guests walked through a virtual sea of Red, White, and Blue as they moved from the parking lot towards the front door. About twenty of Charlie's Brother and Sister Officers from the Department of Corrections formed an honor corridor within our tunnel near the door. Guests passed through their corridor prior to entering the Funeral Home. The family limo arrived. I'll never forget watching Charlie come out first, then came Danielle with a helium filled balloon. It was none other than Branden's favorite, Sponge Bob! I felt one of the only smiles of that day cross my face. Pfc. Cummings was known as "Jokester" to those who were close to him and I felt that Sponge Bob's presence at this somber occasion would have pleased him. We stood the flag line until services started and took a break. After about fifty five minutes, the Funeral Director gave us the heads up that the service was nearing it's end. We formed a wall of Flags around the hearse at the north end of the building. The Pall Bearers were all Brother Officers from the Department of Corrections. They carried Pfc. Cummings' Flag Draped Casket to the hearse with the greatest of care as we stood in silent respect. The door was closed and we moved to our bikes and cages for the short procession to the cemetery. The Patriot Guard Riders had been asked to lead the procession. We placed Tim (talk2e) Ellenbecker on the front right corner of the hearse flying both the United States Flag and the Flag of the U.S. Army. 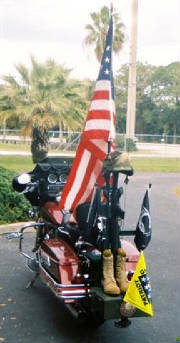 We placed Everett (OLD-Cop) Butler on the front left corner of the hearse with his bike mounted Fallen Soldier Memorial. It took only a few minutes at parade pace to reach the grave site. We dismounted and formed a circle of honor around the grave site with our flags. The white gloved Pall Bearers removed the Flag Draped Casket and carried it to the grave site with the same respect and care that they had shown previously. The guests were seated. The religious portion of the grave side service was performed by Reverend Joe Robinson. The Patriot Guard Riders were called forward and Bobbie presented the Plaque to Charlie. Both Danielle and Charlie were presented Mission Accomplished pins. The Military Honors followed. Three Volleys pierced the silence and brought many to tears. Taps was sounded, driving home the finality of the moment. The flag that had draped Pfc. Cummings' casket was folded, passed up the Chain of Command, and presented to Charlie. Branden's medals, including the Combat Infantryman Badge that he had wanted so badly were presented also. Pre-folded flags were placed on the casket and then presented to Danielle and Branden's mother one at a time. The Pall Bearers stepped forward one at time and each respectfully placed their white gloves and a red carnation on the casket. The mission that had begun on foreign soil nearly two weeks earlier in what one of the Sergeants from Pfc. Cummings' platoon describes as "this replica of hell" was nearing a conclusion in this idyllic Florida setting. Thank you to all of the Motorcycle Clubs and Organizations that came together to stand in honor of Pfc. Cummings and in support of the mission of the Patriot Guard Riders. I would try to name all of the Clubs and Organizations but am concerned that I might leave one out. You know who you are. Thank you to all of the individual riders who came to show respect for this American Hero, his family, and his community. Special thanks to those who traveled long distances. You know who you are. Thank you to the staff of Brevard Memorial Funeral Home. Your compassion and caring for this family was evident throughout. Your understanding of and cooperation with our mission is deeply appreciated. Thank you to the U.S. Army and all Military personnel involved. Thank you for your service and for what you did for Pfc. Cummings. Rest in Peace Pfc. Cummings, your mission here is accomplished.